Wanna “snow” what’s new in the DR? New year brings a whole new lease on life my friends. It’s like being let out of a tight space and away you go! That’s how we’re feeling as well. While it is winter here (10-12 C/60-70 F early in the morning), we still get a chuckle over hearing phrases like “Have you noticed how cold it is this winter?”…and “It was so cold last night I had to turn my ceiling fan off”. Some of these realities we live in can send your mind in circles. Others are just fun. I MISS SNOW! The words we’ve heard annually with this year being no exception come from out own goof troop. Most of their Dominican friends think they’re nuts but also have a tinge of envy wondering what a winter with snow would really be like. Pretty much on a daily basis you will hear one of our kids comment on how much they miss the snow and snow storms that lock you into the house and…sorry…my old brain just sent shivers through my body thinking of the flip side reality…snowblowing, shoveling, scraping windshields, icy water in the boots. Probably time to help our youngin’s appreciate the current blessing they live in. 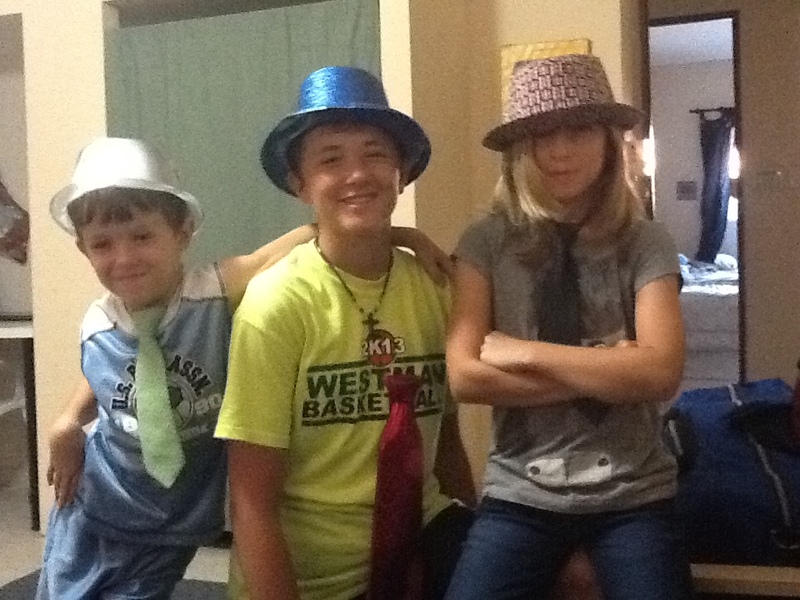 Speaking of the youngin’s…here they are, in all their glory on a sick day no less when, for the first time in our family, all three kids & mother were home ill with sinus and throat problems. Looks like a rough day. GIVING BACK Like any normal family we had a great time with our kids during their Christmas programs and all of the fun activities they were involved in. Another event that took place over holidays was so beautiful, I just have to share it. 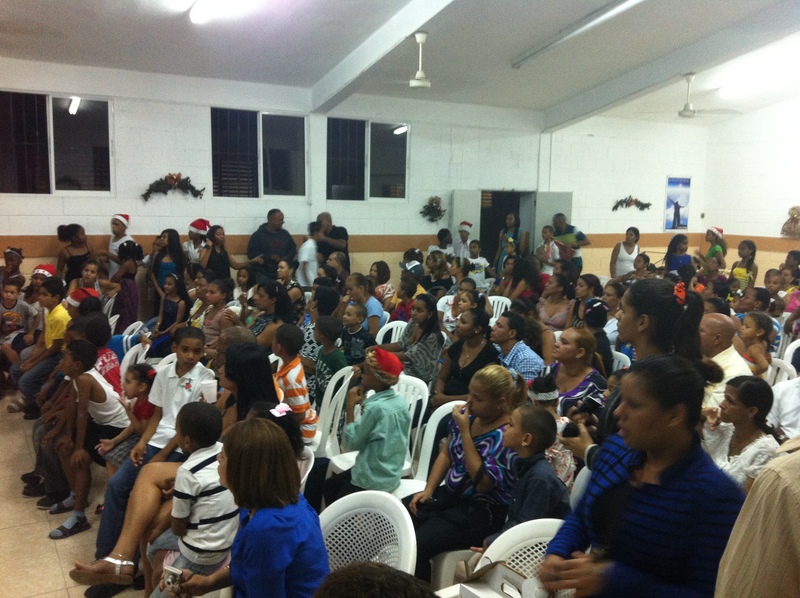 Our little Dominican church of about 60-70 people hosted a Christmas Celebration for the neighbourhood where many of the families live in what’s known as “the hole”. Basically, you have thin passage ways to walk with apartment style houses stacked two, three and sometimes four levels high. Income for these families is extremely limited so theft, prostitution and pretty much any other underground occupation you can think of exists there. The people though…are awesome. We love them to pieces. So when our school provided 50 boxes of food, Cedarville College out of the U.S. offered lunch kits and students from our school bought Christmas gifts for every child who attends the barrio school in our church…what opened up was an amazing night where the rich and poor, believers in Jesus & those who could care less…gathered in a little church building and experienced the love of our Lord in a very special way. Our little DR church filled with local families receiving gifts of food for the holidays…Many of these families live on less than $100 a month. HELPING THE HELPER Aurelia is one of the caring women who works long hours to take care of the hundreds of students on our Santiago Christian School campus each day. The incredible irony of this is that while cleaning up after us, she goes home each night to her own house with a dirt floor. Not gonna happen anymore! The staff and students got together with this crazy idea to host a “Jeans Day” on campus where everyone pays some RD$ to be able to where jeans to school…tell that one to North American kids:). “Jean Days” usually raised money for classes to take trips, etc. 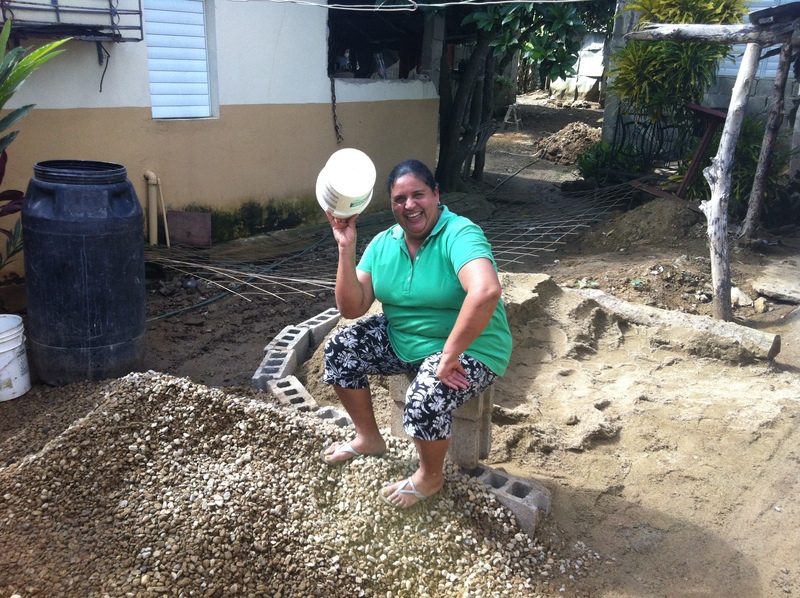 We raised enough RD$ to buy re-bar, concrete mix, sand, etc. and on one fun Saturday, a bunch of us went to help her family pour a new concrete floor in her house. If ever someone deserves this kind of “Random Act of Kindness”, Aurelia did. 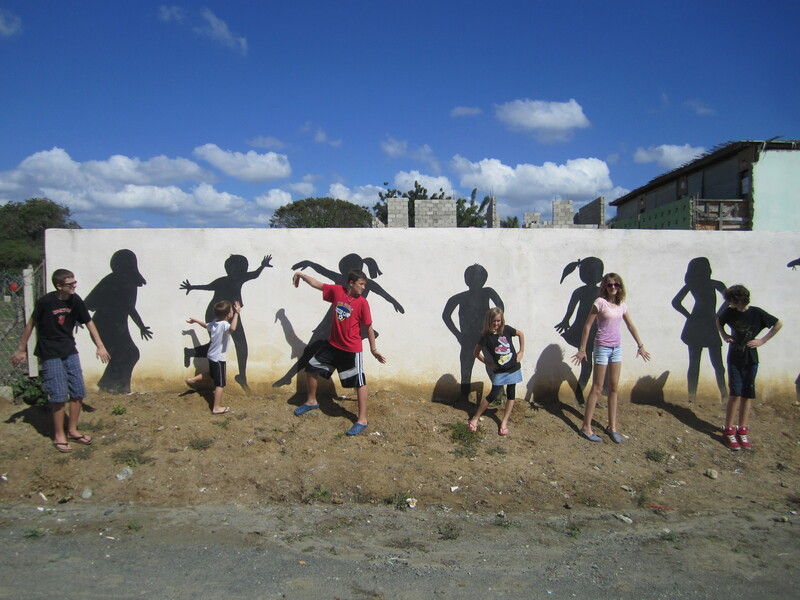 Her family saw a bunch of wacky gringo’s living the love of Jesus in an equally wacky way. THE FARQUHAR’s HAVE LANDED! Any time we have the chance to receive a visit from friends and/or family we’re pretty stoked. Over the holidays our awesome friends Brad & Lynette Farquhar dared to bring their family for a visit 🙂 So fun! 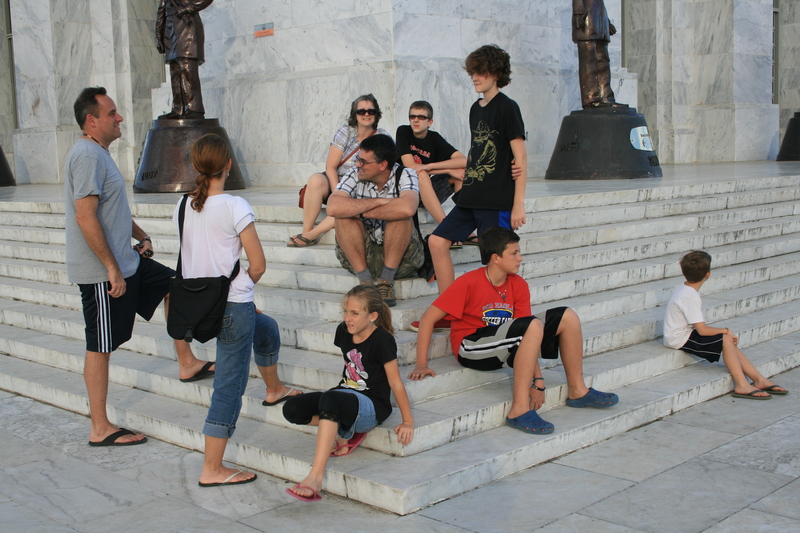 The kids hung out, shared stories along with their love for reading and apparently mutual adoration for “Lord of the Rings” and we trekked to all sort of cool places on the island. Thanx so, so much Brad & Lynette for making this holiday season a very special one. You rock! Hangin with the Farquhars (minus Annie taking the pic). DISCIPLESHIP CATCHING ON The beauty of watching students begin to “catch” the realness of Jesus and just how deeply His truth can impact their lives captures your heart . Many of our students have a religious background though knowing a saviour is still a bizarre and sometimes foreign concept for them. Through the prayer and dedication of some of my volunteers like Melissa S., Steve M., Angie K., Steve N., Sarah, Ally, Matt, Beth, Kellie, Vera, Leah, Jenn & Becky, Megan B. and of course Tracey…we are seeing students digging deeper and deeper. The truth that discipleship doesn’t happen overnight is embedding itself in the ministry and the opportunities are opening up. This past week our athletic director spend time with an alumnus and it was obvious that the hand of God was on both him and the young man he met with. Please pray that this becomes the new “normal”. So many hearts & lives can be touched. SPIDER WOMAN!!!! On a cold, damp January morning, heroic P.E. 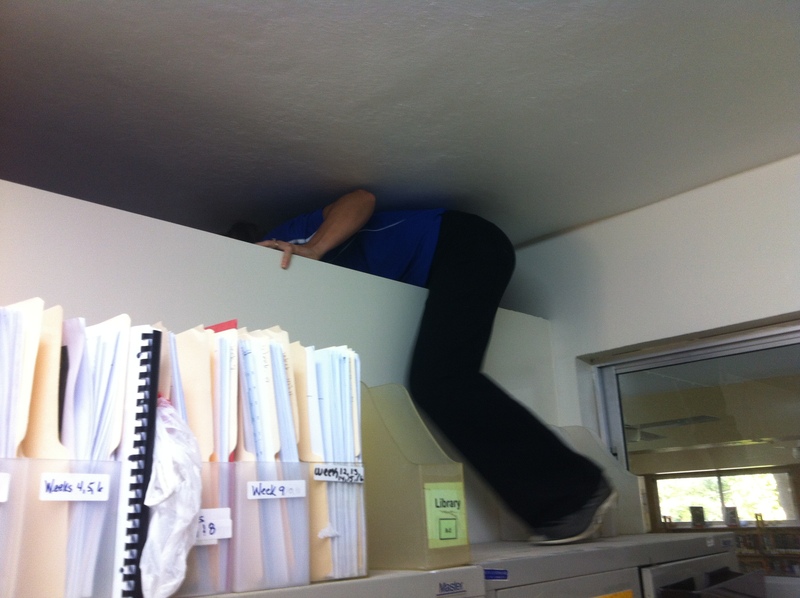 teacher Tracey Houck, aka “Spider Woman”, faces almost impossible odds to rescue “llaves” (keys) from certain peril. Motivated by her successful victories over the endless encounters with gymnasium tarantula’s this local super hero sheds all resemblance of fear to scale the dividing well between her and the “llaves”. Mere seconds elapse and then…freedom!! Today we pay homage to this selfless hero. GRACE BAPTIST MISSION TEAM February 22-March 1st we’ll be hosting our fourth mission team from Grace Baptist in North Dakota. The passion and work they have put into their mission here is something special. 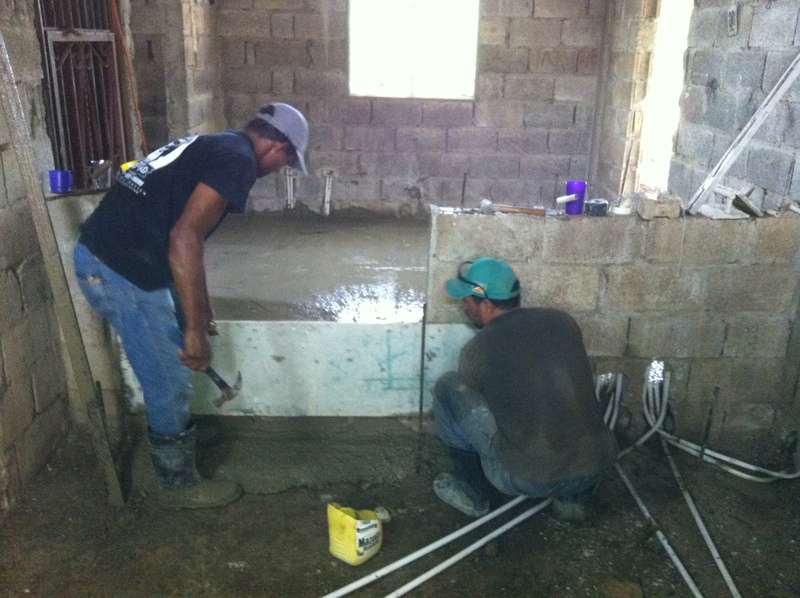 A team of 11 adults will arrive in the wee hours of the morning and spend a full week doing electrical & painting in the new kitchen at Primera Iglesia (church) they have fully funded through long-distance fundraising to build. Sewing is also on the agenda for this trip. 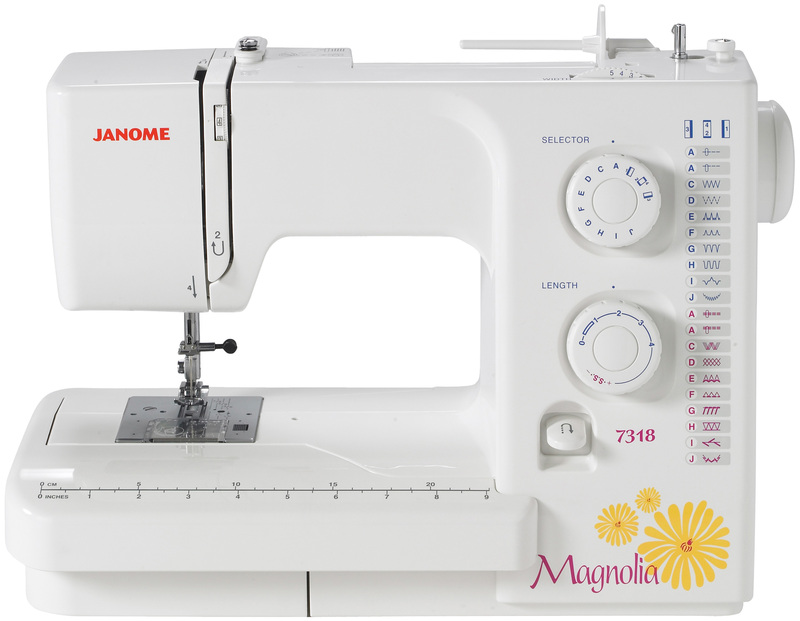 The church has purchased a number of brand new sewing machines for a sweat deal and will teach local ladies how to use these particular machines then give them to the church. 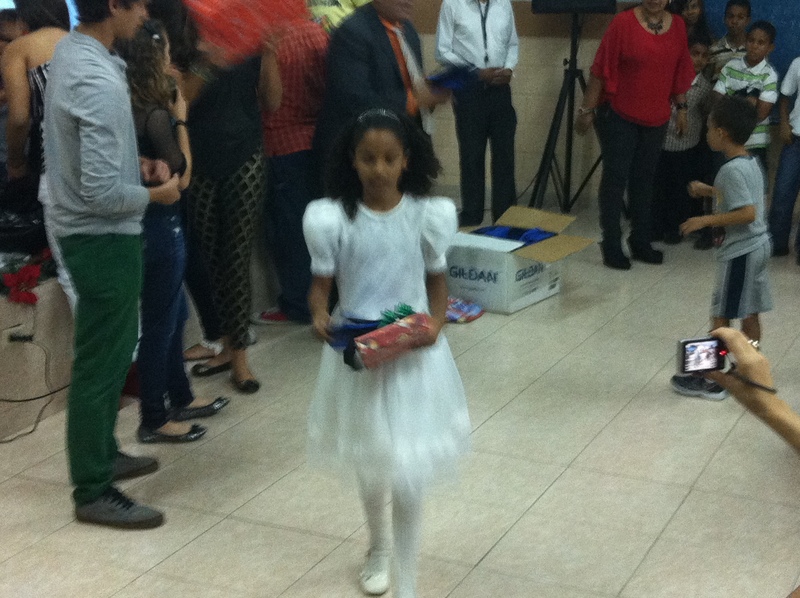 Do you remember that earlier picture of families from the barrio near our church at the Christmas event? Do you remember what many of them feel the have to do to earn a living? Grace wants to make a small dent in that and help change some lives by providing both training and the actual machines so some of our godly church ladies can teach girls & ladies in the barrio how to sew, giving them a trade, and share the truth of Jesus throughout. So very cool! I cannot wait to update you next time on this. THINGS THAT MAKE YOU GO, HUH? So, what happens to the “rich guy” who decides not to pay his electric bill because he doesn’t feel like it? Apparently this! Don’t pay your bills? 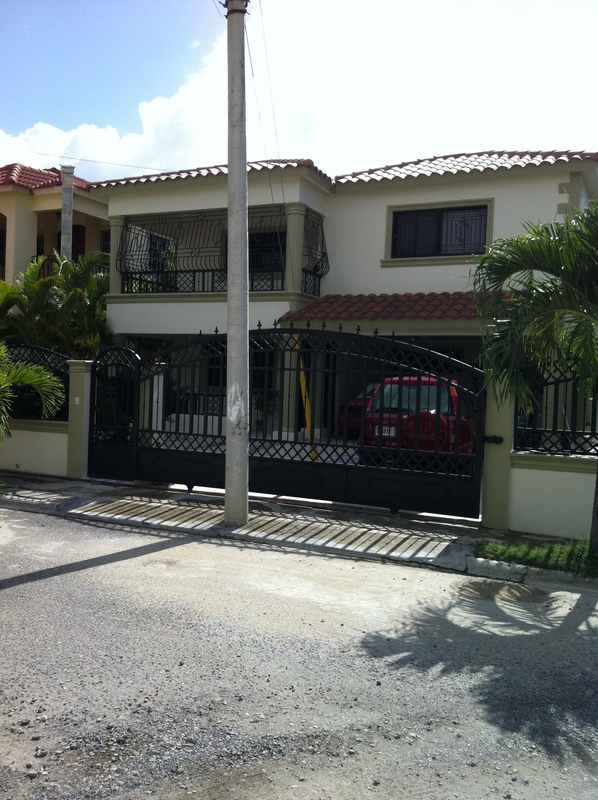 Receive a concrete electric pole in the middle of your driveway. 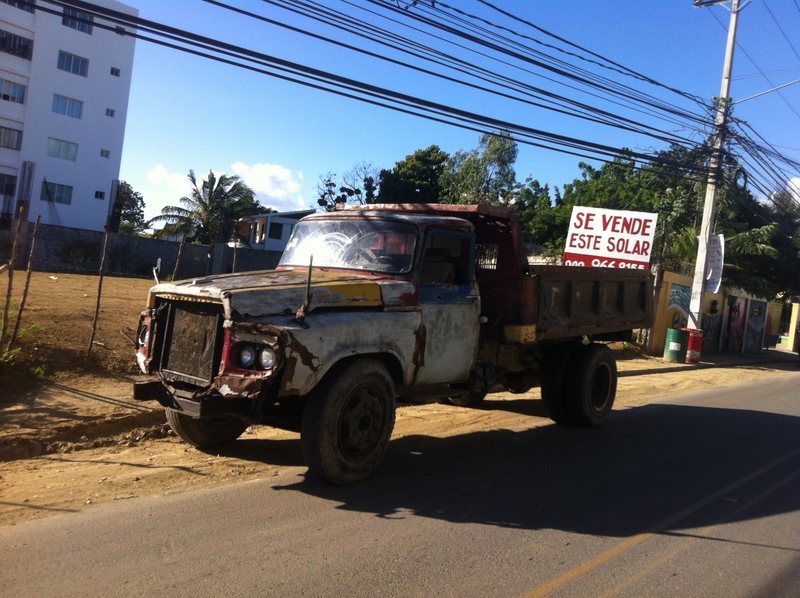 Fully functioning construction truck…sweet ride! 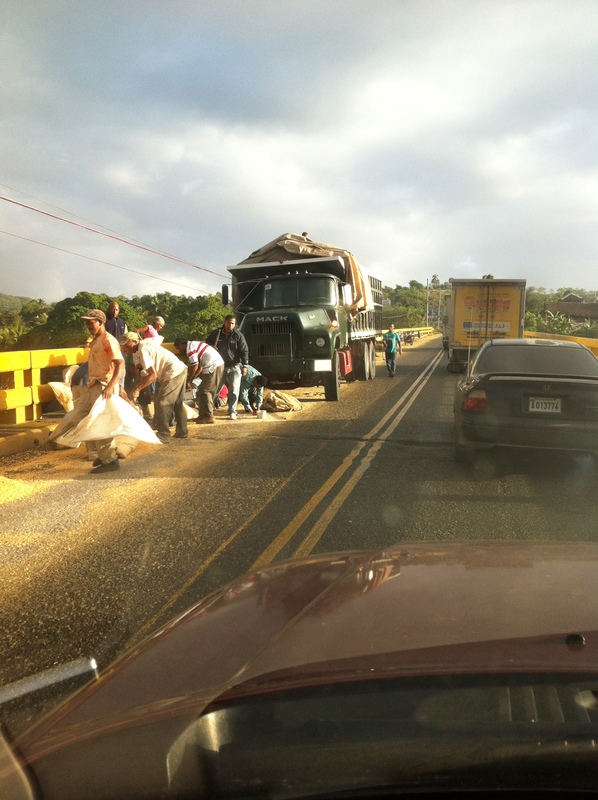 What stinks for the driver is a winfall for the neighbours as a truck hauling corn loses it’s load on a local bridge. Thanking God for health after a 4 week stretch of nasty sinus headaches, coughing and Tracey losing her voice (for a couple days). Stoked about the “God Conversations” happening around campus. Pray for me (Tim) as I attempt to answer questions students are giving me “secretly” on scratch paper. So much searching amongst so much fear of being seen as weak. Pray for Tracey as she continues to morph elementary P.E. classes into spiritual and life lesson times. I wish all of you could hear how amazed staff are at her ability to turn chaos into Jesus moments. Pray for the GRACE BAPTIST Mission Team arriving February 22nd – safety, effectiveness, cross-cultural understanding, and enabling local ministry. 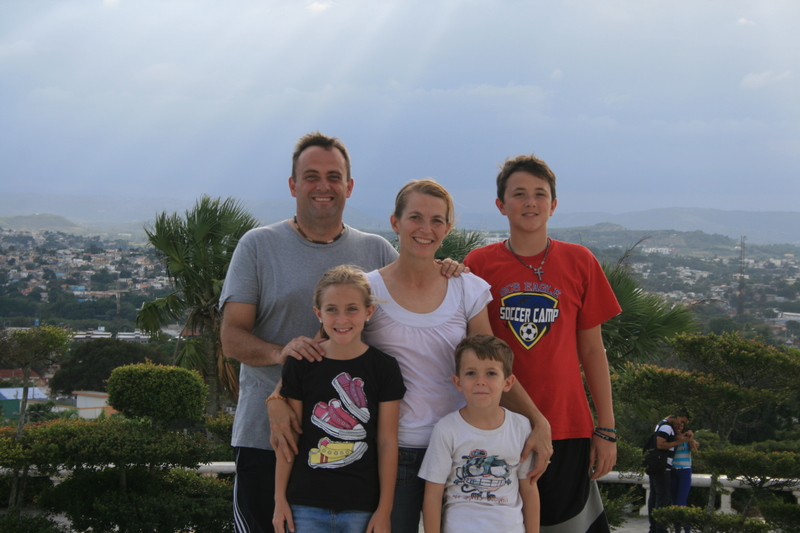 Until next time…Blessings from the Houck Family Adventure in the DR. This entry was posted in Uncategorized by Tim Houck. Bookmark the permalink.